Escape From Monkey Island was the last in the long line of Lucasarts adventure games and was no doubt one of the factors in its demise. The previous entry Grim Fandango had been critically well received but was something of a commercial failure. Neither game was helped by their use of a new game engine which shelved point and click in favour of Alone In The Dark style tank controls. This was a huge step back and resulted in a control scheme that was slightly more awkward than Sierra’s AGI games had managed a decade earlier, with no benefit whatsoever for anyone playing the game on a PC. The tail end of the 90’s was an era when everything had to be in 3D no matter what though, much to the detriment of adventure games of the time. At least Grim Fandango had a great game underneath (admittedly with a few unfair puzzles). My memories of Escape From Monkey Island are far less favourable. The humour and story were a real letdown, with much of the game rehashing tired old Monkey Island clichés and failing miserably when trying to introduce anything new. If this was where Lucasarts were heading, I should probably be thankful that Sam and Max 2 and Full Throttle 2 both ended up being cancelled. 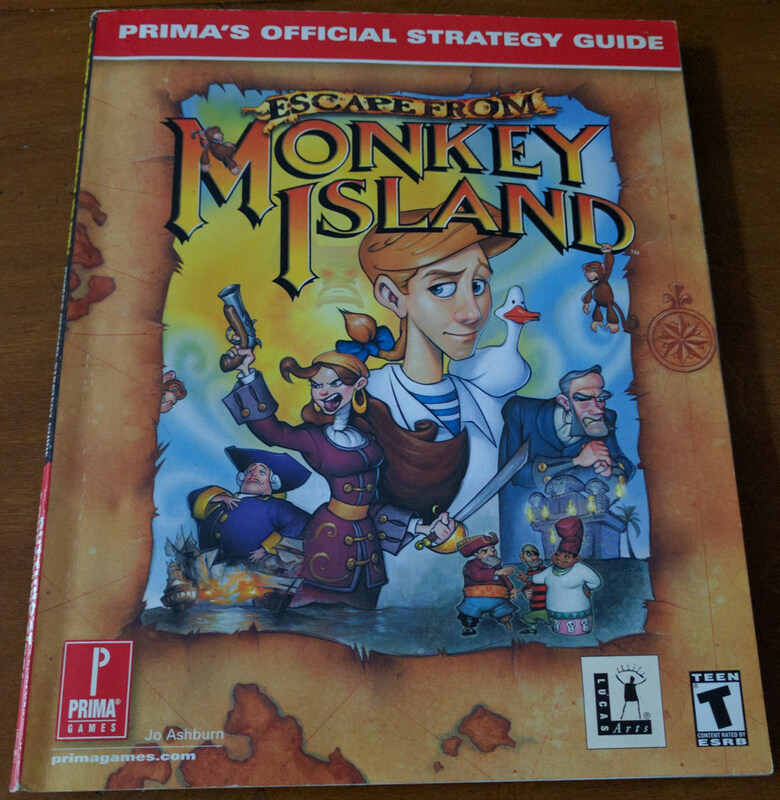 It did of course get a Prima strategy guide in 2000 which is what I’m supposed to be posting about here. I must have scanned this in years back and never got around to uploading it but the pdf is now available on the downloads page. I don’t normally read any of these things until I’m playing or have just played the game in question so this has been sat around unread for some time. I did have a quick flick through and while it brought back bad memories of the game, it looks to be a potentially decent read with some nice concept art, a history of the first 3 games, brief hints, an entirely useless map section, and a lengthy walkthrough (as told by Guybrush).